25 years of experience in office cabling solutions for London companies at your service! Whether your office is relocating or being refurbished, let us handle all your office cabling needs. Our work comes with a 100% satisfaction guarantee! ACCL can carry out any form of cable installation, from a standard voice and data network to more sophisticated Ethernet or fibre optic networks. Not sure what your office cabling needs are? No problem! Our team of technicians and engineers, are on hand to help and advise you on the best solutions to increase efficiency and cost-effectiveness. CLICK HERE TO CLAIM YOUR FREE NO-OBLIGATIONS ON-SITE SURVEY! Do You Need Our London Office Cabling Solutions? Are you in the process of moving your office? Are you considering a complete refurbishing or redecoration of your office? Do you want to boost the performance of your network? Are you looking to deploy and WiFi network and need cabling? Are you looking to upgrade your network? Does your current cabling setup look like a spaghetti mess? Do you want to be compliant with the current Health and Safety regulations? If you answered “yes” to at least one of the questions above, then our office cabling solutions are perfect for you. Office cabling – re-routing wiring or upgrading networks – is an integral part of the office move or refurbishment. Using a professional office cabling company in London will ensure that you don’t compromise speeds, capacity or the integrity of your data. 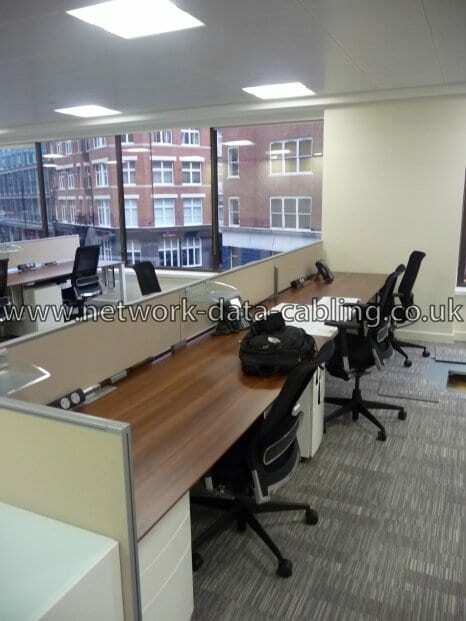 ACCL is London’s top office cabling specialist. We can provide a complete service, including data cabling, wiring computer networks, telecom systems, Wi-Fi and VoIP (voice over IP), internet phone systems and commercial building electrical installation services. At ACCL, we strongly believe in tailor-made cabling solutions designed to last. In other words, we want to make sure that you get the most out of your investment. We identify your needs. We sit down with you to find out how many devices will be used in your office and for how long. Our technicians take everything into account, from work stations to servers and phones. Are there any space-related concerns? We find out whether your server room can easily be connected to all the devices, if there are thick walls or other devices that interfere with the Wi-Fi signal and more. Look to the future. If you’re planning to expand or hire more people, we will make the necessary provisions to ensure that your current cabling infrastructure can easily handle your growth with minimal work and costs. NEED AN IN-DEPTH LOOK AT WHAT WE CAN DO BEFORE YOU COMMIT? CHECK OUT OUR CASE STUDIES! Cables need to be as short and as tidy as possible to avoid accidents. Health and safety always come first. All cables in your office need to be easily identifiable. Cabling infrastructure grows in time. Labelling cables makes it easy to scale everything without spending hours trying to identify each existing cable. Structured cabling solutions (which bundle all your wiring and connection needs in a single network) are applied whenever possible. We aim to find the best cost-performance ratio. Whenever a more affordable solution can be applied, we will choose it. Our office cabling services are minimally intrusive. We will do our best to disrupt your workflow as little as possible. READY FOR YOUR FREE, NO-OBLIGATIONS ON-SITE SURVEY? We offer tailor-made packages for office refurbishment to each customer. We carry out full site surveys to assess your London office, warehouse or industrial building’s current data cabling network systems. We work on agreed budgets – you’ll get no surprises with us! We can design and install a new or a refurbished network cabling infrastructure to meet agreed performance and environmental requirements. We test all of our networks prior to installation and post-installation. We have completed data cabling and computer networking contracts for businesses large and small, including retail, warehouses, professional firms and regional offices throughout the UK. We are experienced, knowledgeable and friendly. We ensure Health and Safety compliance. We are neat and professional, using dado trunking, skirting trunking, modular floor systems, tray work, basket trays and ceiling voids for quality finish in any environment. We offer full documentation and the option of warranties and full maintenance support. Don’t take our word for it! Head on to our testimonials page to see what our clients have to say about our services. We take great pride in our ability to accommodate any business, irrespective of the size of their headquarters and of their cabling and connection needs. ACCL have worked with stadiums and small startups and delivered excellent results every time.